Once upon a time there was a little witch. She was the youngest of seven children to the great witch Mamadoo. For the past 237 years, Mamadoo had wreaked havoc across the country, leaving her with the byname “the wicked witch”. But these times are over now. She grew old and doesn’t even have the strength to feed all her 27 cats by herself anymore. Usually she spends her days in bed with a cat in her lap, smoking grasshoppers and indulging in dishes her kids cook for her. According to the old books of witchcraft, the best remedies to heal the sick are stews made of snake tails, frog eyes, spider legs and things like that. The little witch, however, has recently secretly visited one of the big human cities by night in search for a remedy that could give her mum the energy back that she once had. The trip was worth it. She learned about some seeds rich in fiber, healthy fats, antioxidants, omega-3 and omega-6 fatty acids . When she found out that these super-seeds are also high in calcium, iron and magnesium and have been known in South America for ages, she grabbed some bags of chia seeds on her way back home. To disguise the fact that she was using ingredients, prohibited by the old books of witchcraft, she had to use her creativity to fool her very traditionally-minded mother and siblings. Here’s what she made her mum for breakfast this morning. 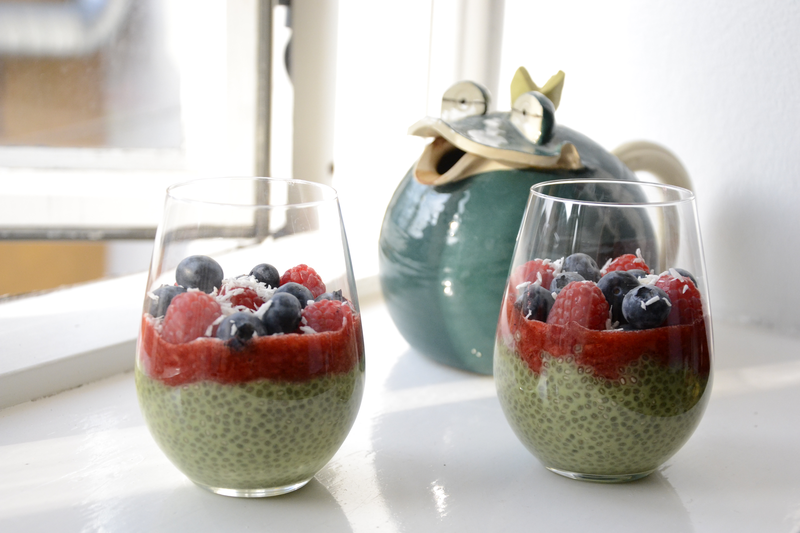 Mix matcha powder with about 4 tablespoons of the milk and whisk well to avoid any lumps. I decided to use rice-coconut milk as it has a natural sweetness that goes well with the matcha powder. You can use any other milk substitute or milk, though. In that case you might need some maple syrup or honey to give it a sweet taste. Pour mixture into the remaining milk, add chia seeds and mix well. Let sit for about one hour or overnight until a pudding-like consistency forms. Heat raspberries and strawberries in a small sauce pan, add vanilla extract and maple syrup if using and let cook for a few minutes. 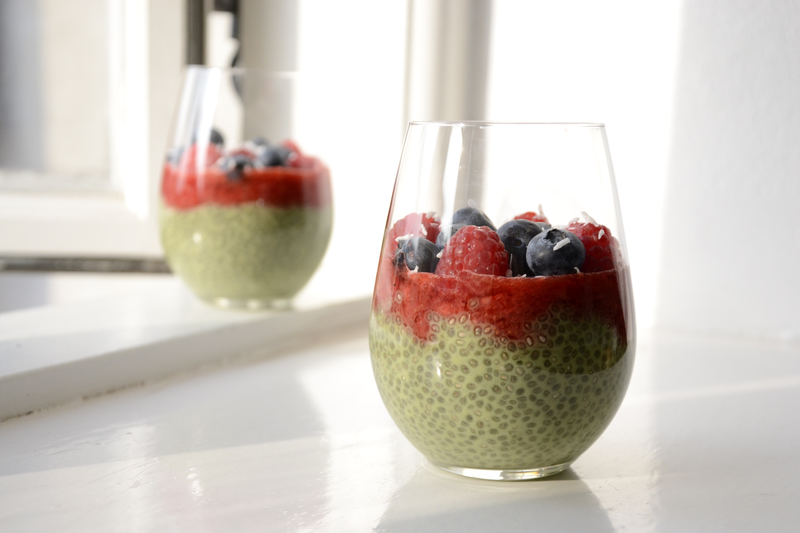 Pour chia-pudding into a glass, top with the blood (a.k.a. 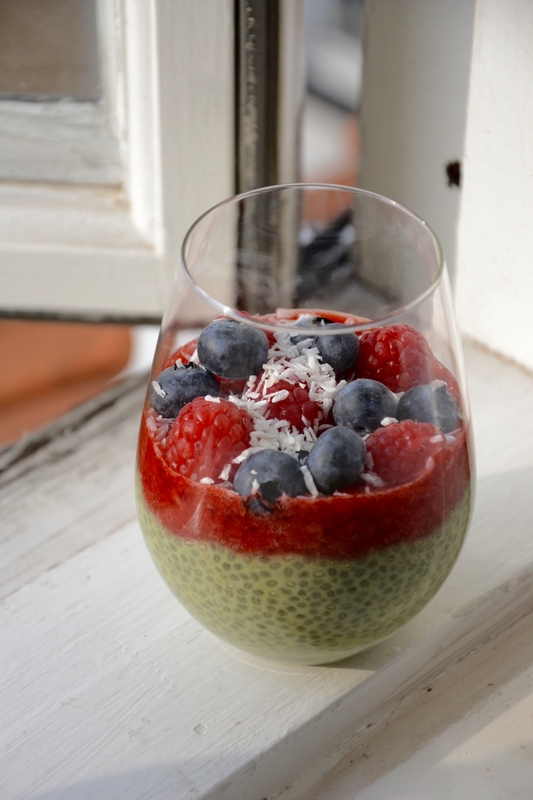 berry-mixture), fresh berries and some coconut flakes. Happy Halloween! Enjoy your frog eggs!